The FIFA/Pro Evo debate will rage on for another year. But not for me. I won't be getting Pro Evo. 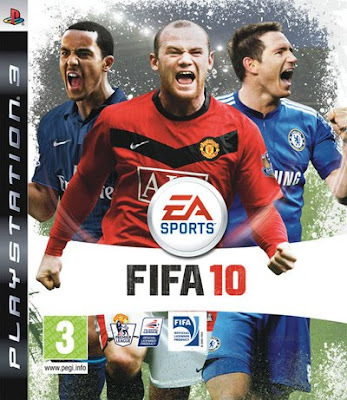 FIFA 10 is that good. Last years game was great, a real step forward for EA, but this 'refinement' is glorious. The full 360° control has been much hyped by EA and for once justifiably so. It really does add so much depth to the play. Of course EA have always had the licence and all the detail that brings but now that's the icing on the cake and not the only reason to buy the game. The gap was narrowing between Konami's offering and FIFA but now it's EA that are moving away from their competitor. Pro Evo is going to have to be a pretty special game this year to tempt me into a purchase when this is such a strong offering. There is so much depth here to explore. A twenty year management career, the four season Be a Pro mode where you can play as one player in your favourite team, online games that don't glitch and the list goes on. You feel like any error you make is your own fault, apart from the odd mystifying stray pass, because the control is so great. There is so much you are able to do. Want to block a cross? Press the jokey button to make yourself bigger. Need to kill your pace fast and slip inside the last defender? Hit the skill button and then speed away. Great stuff. Liverpool feel like Liverpool and unlike last years game you can tell who's got the ball at any time by the way they look and the way they feel as you move them around the pitch. Each player has their own weight and strength which makes such a difference when two players are battling for the ball. You get a real sense of two players jostling for possession. The commentary is stunning. Andy Gray and Martin Tyler provide it as they did last year, but this is more than just a re-hash, the level of detail is truly admirable and never sounds scripted. You get the sense that they really enjoyed recording it too and you would have to play for months to hear everything that is on offer. I need to point out that JMcG hated it. I hope that he gives it a proper go today because my win in yesterdays Ledger came off of the back of two days of solid play. I could see online Ledger Leagues becoming as much of a fixture as our get togethers at one another's houses. If you have a PS3 or and XBox and love football this is a game that you simply have to have. A remarkable achievement and for me the first truly next gen football game. Stunning.